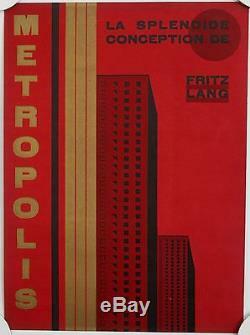 Metropolis - La Splendide Conception de Fritz Lang', 23 x 31 cm / 9 x 12.25 inches, advertisement from a French graphic-design trade magazine, Christmas annual, entitled L'Imprimerie et La Pensée Moderne , Bulletin Officiel des Maitres Imprimeurs, Paris, 1928, 362p. 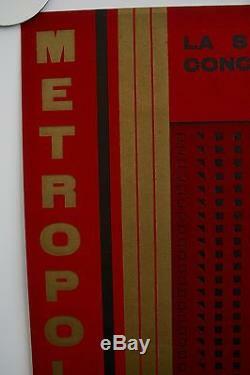 Includes a copy of an unattributed Metropolis poster, printed on heavy stock red paper, embossed with gold. This rather crude image has been attributed to Boris Bilinsky, though it is more likely by another artist, and based on Bilinsky's work. The item "Fritz lang metropolis original poster 1928 ultra rare" is in sale since Tuesday, February 7, 2017. 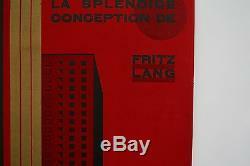 This item is in the category "Entertainment Memorabilia\Movie Memorabilia\Posters\Originals-International\Pre-1940". 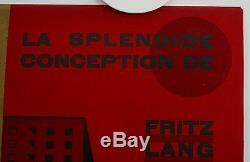 The seller is "bluerobin76yakob" and is located in London. This item can be shipped worldwide.